It's unfortunate that the majority of healthy, organic, and local foods tend to be more expensive than their conventional counterparts. It can make eating clean and wholesome foods that much more challenging, stressful, and unappealing. As someone who is typically always on a budget, I've been there! That's why I like to buy foods that will give me a good bang for my buck, meaning I want to get a nutrient dense punch if I'm going to be spending my hard-earned dollars on it. While I've been able to find lots of different healthy foods for decent prices, I have a list of my top 5 nutrient-dense foods I always have stocked in the kitchen. I picked these 5 because not only are they fantastic for maintaining gut health, but they'll also help your face look like a ray of sunshine. These tiny little powerhouses are one of my favorite ingredients to add to smoothies, salads, eggs, yogurt, oatmeal, you name it. I add these babies to everything! Two tablespoons of chia seeds provides you with 10 grams of fiber, 4.5 grams of protein, 8.6 grams of heart-healthy fats, as well as vitamins and minerals such as calcium, manganese, phosphorus, and zinc. Chia seeds are rich in omega-3 fatty acids and antioxidants, both of which help fight off radicals, protect your heart from inflammation, and prevent premature aging (aka, smooth and youthful skin). The specific omega fatty acid in chia seeds called alpha lipoid acid (ALA) has been shown to limit the growth of cancer cells, as well as cause death to cancer cells without harming the healthy ones. That sounds like a pretty dope alternative to a round of chemotherapy, right? You can buy a package of these for practically just $2 at Kroger, or if you're at a store with a bulk section, that's the perfect opportunity to stock up on a big bag for a cheap price! Sprouts are one of the cheapest and easiest superfoods you can add to salads, sandwiches, burgers, or omelets! These little baby sprouted shoots are only $2 for a container at Whole Foods or Fresh Thyme and last me for at least a week and a half. Sprouts provide you with 38% of your daily vitamin K, a nutrient that can aid in minimizing menstrual and menopause symptoms as well as help build bones and prevent osteoporosis. With an additional 14% of your daily vitamin C, 9% DV folate, and 4 grams of protein, this proven high-antioxidant food is an easy and healthy addition to your meals. And who doesn't love the name alfalfa? Don't be afraid to try other sprouts as well... broccoli sprouts, pumpkin sprouts, sunflower sprouts, bean sprouts... there are tons out there for you to try. Make sure you add these to your meals in their raw form! When cooked or heated, the process will break down and destroy many of the sprouts' vitamins and enzymes - and the enzymes are what are so important for the digestive process! Not all superfoods have to be veggies! As someone who has a massive sweet tooth, keeping dark chocolate in the pantry is pretty much essential to maintaining my sanity. Not all chocolate is created equal, however. I make sure to buy dark chocolate with at least 70% cacao (not to be confused with cocoa). The higher the cacao percentage, the more bitter the chocolate typically. But trust me, at 70% it is plenty sweet! Cacao is what contains all those heart-healthy antioxidants and gut-friendly prebiotics (the food that fuels the probiotics), so the more that you have in your dark chocolate, the better! Polyphenols and flavonoids are the two main groups of antioxidants found in cacao-rich chocolate, both of which are amazing heart health warriors. Reduction in LDL cholesterol, blood pressure, and an increase in blood circulation are just a few of the amazing benefits. There are tons of dark chocolate brands and bars out there, but I love Kroger's Simple Truth Organic 72% Cacao Dark Chocolate Chunks (holy mouthful) the best. A handful of these (or maybe half the bag) satisfies both my sweet tooth as well as provides me with some awesome nutrients. If you have more self-control than I do, this bag will last for a while, too. An ounce of cacao-rich chocolate gives you 3.1 grams of fiber, 27% DV manganese, 25% DV copper, 19% DV iron, and 16% DV of magnesium. This brightly colored spice is super popular in most Indian curry dishes, but it's a spice that can be added to almost any savory meal. We underestimate the power of many spices and herbs out there, but turmeric is one I think everyone should start to include in their daily diet. Turmeric's most potent compound, curcumin, helps combat not only physical diseases but mental ones as well. It fights overall inflammation, boosts skin health, fights depression, combats arthritis, and reduces the risk of blood clots. Turmeric is known mainly for its impressive anti-inflammatory properties and has been used as a supplement (particularly its curcumin component) to combat various types of arthritis. Whenever you use turmeric, make sure to also add black pepper! The black pepper actually enhances the absorption of the curcumin, allowing you to fully reap its many benefits. Adding turmeric and black pepper to scrambled eggs is a super easy way to get your daily fix. I also use it as part of a seasoning/marinade for my tempeh and include it in a turmeric, lemon, ginger tea I make in my french press. If possible, do your best to buy organic spices. When not labeled as organic, you risk having spices and herbs contaminated with pesticides and bacteria, artificial colors, preservatives, and other ingredients that the FDA is not legally required to tell you about. Trust me, it's worth the one extra dollar. I have become extremely addicted to fermented foods as of late. I can't get enough of spicy kimchi and sauerkraut... I tend to just eat it straight from the jar! What exactly is kimchi? In a nutshell, kimchi is a mixture of salted and fermented vegetables, typically cabbage, as well as radishes, peppers, and onions. With the vegetables typically comes chili powder, vinegar, garlic, and other spices. With this spicy dish, you'll obtain Vitamins A, B, and C, along with probiotics and enzymes from the fermentation process that contribute to better immune function and gut health. Your skin quality can be directly related to gut health. When your gut is inflamed from various things like food sensitivities or an imbalance of good bacteria, it will manifest itself from the inside out directly on your skin! Therefore, when you provide your body with pre- and probiotic-rich foods and cut out food sources that irritate your gut, you begin to decrease that excess inflammation which in turn will leave you with much clearer skin. If you don't eat kimchi straight from the jar like I do, you can add it to scrambled eggs, salads, soups, and broths, etc. This stuff is only about $5-$6 a jar depending on where you get it from - much cheaper and longer lasting than kombucha which tends to be at least $3.50 a pop. (But I still buy it because it's delish). Eating healthy doesn't have to be detrimentally expensive. I do my best to eat foods that pack a real nutritional punch, which in the long run has me buying less but reaping maximum benefits! Some other superfoods I eat on the reg are avocado (full of healthy fats, fiber, and vitamins), maca powder (an adaptogen used for stress relief and energy support), spinach (which has a crap ton of vitamin K, folate, and calcium), and raw ginger (incredible for digestion). 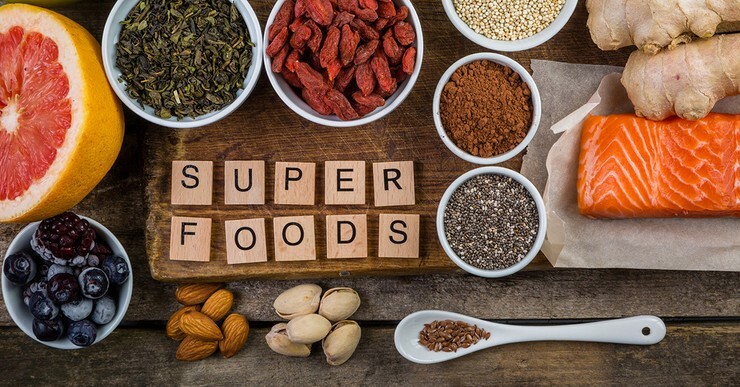 Try adding some of these superfoods into your everyday meals and you'll be well on your way to enhancing your health little by little without burning a hole in your wallet! Newer PostWhat The Heck Do I Pack My Kid for Lunch? Older PostWhich "diet" is right for you?